Note: Turkey isn't deploying troops for combat (yet); they're deploying troops to a Turkish base in Qatar. This has been in the works since before the crisis began, but there's no doubt it adds to the tensions. Pakistan has decided to send military contingent to Qatar after a similar decision was made by Turkey, Pakistani media outlets reported June 9. The diplomatic crisis surrounding the Gulf escalated further Friday after Saudi Arabia and its allies placed a number of Qataris and Doha-based organisations on a "terror list". As many as 18 individuals were named, including members of Qatar's royal family and a former minister. Also named were Doha-based Muslim Brotherhood spiritual leader Yusuf al-Qaradawi and Qatari-funded charities. The list was published jointly by Saudi Arabia, the United Arab Emirates, Egypt and Bahrain - which accuse Qatar of supporting Islamist extremist groups and have cut ties with Doha. "This list is connected to Qatar and serves suspicious agendas in an indication of the duality of Qatar policies," said the statement. It shows that Qatar "announces fighting terrorism on one hand and finances and supports and hosts different terrorist organisations on the other hand". In all, 59 people and entities were listed. It was released hours after Qatar's Foreign Minister Sheikh Mohammed bin Abdulrahman Al-Thani said Doha would not "surrender" and rejected any interference in its foreign policy. Qatar said the blacklist had no basis in reality. "The recent joint statement issued by the Kingdom of Saudi Arabia, Bahrain, Egypt and the UAE regarding a 'terror finance watch list' once again reinforces baseless allegations that hold no foundation in fact," a government statement read. "Our position on countering terrorism is stronger than many of the signatories of the joint statement - a fact that has been conveniently ignored by the authors." It added: "We lead the region in attacking the roots of terrorism." Interesting to see how this develops further. I wonder if it'll just blow over as these things tend to or if this will actually escalate. (WASHINGTON) - The government of Qatar has hired John Ashcroft, the U.S. attorney general during the Sept. 11 attacks, as it seeks to rebut accusations from U.S. President Donald Trump and its Arab neighbors that it supports terrorism. Qatar will pay the Ashcroft Law Firm $2.5 million for a 90-day period as the country seeks to confirm its efforts to fight global terrorism and comply with financial regulations including U.S. Treasury rules, according to a Foreign Agents Registration Act, or FARA, filing on Friday with the Justice Department. "The firm's work will include crisis response and management, program and system analysis, media outreach, education and advocacy regarding the client's historical, current and future efforts to combat global terror and its compliance goals and accomplishments," according to a letter by Ashcroft firm partner Michael Sullivan included in the filing. …The crisis is a major diplomatic test for the United States, which is a close ally of countries on both sides but has given mixed signals on whether to isolate Qatar or bring it into talks with other Gulf countries. Trump on Friday accused Qatar of being a "high level" sponsor of terrorism in remarks made shortly after his secretary of state, Rex Tillerson, pushed Qatar's Arab neighbors to "immediately take steps to de-escalate the situation." The dispute between Qatar and other Arab states could lead to war, Sigmar Gabriel, German foreign minister, has told a newspaper. However, he says he still saw a chance to defuse the tension. "There is a danger that this dispute could lead to war," Gabriel told the Frankfurter Allgemeine Sonntagszeitung on Saturday. He cited what he called a "dramatic" harshness in relations between allied and neighbouring countries in the Arab Gulf. Gabriel said personal talks this week with his counterparts from Saudi Arabia, Qatar and Turkey and phone calls with the foreign ministers of Iran and Kuwait underscored his concerns. Russian Foreign Minister Sergey Lavrov met with his Qatari counterpart, Sheikh Mohammed bin Abdulrahman Al-Thani, in the Russian capital. Saudi Arabia, Bahrain, the United Arab Emirates, Egypt and other nations in the region moved to cut off diplomatic ties with Qatar this week. It's the worst diplomatic crisis to hit Gulf Arab states in decades. They accuse Qatar of supporting terrorism and destabilizing the region with ties to their Shiite rival, Iran, and its support for groups such as the Muslim Brotherhood and Hamas. If Qatar are not in the wrong they should look to address the issue in front of global media. There is no need for diplomatic talks with US, Russia or most other power brokers. It isnt hard to make any of Saudi Arabia, Turkey, US look bad. If i was Qatar I would even call up Fox for an interview. How do you start a dairy industry overnight in a wealthy desert nation with its transport links blockaded? You buy 4,000 cows from Australia and the U.S. and put them on airplanes. That is what Qatari businessman Moutaz Al Khayyat told Bloomberg he is doing. The airlift will require as many as 60 flights on Qatar Airways, but Al Khayyat said, "This is the time to work for Qatar." …Qatar is the richest country in the world — its gross domestic product per capita is $141,542, according to 2015 data from the World Bank. The average annual income of native Qataris is reportedly about $400,000. But while Qatari citizens are very wealthy, foreign workers make up 90 percent of the country's population. The low-paid migrant workers, mostly from Asia, continue to face abuse and exploitation, according to a 2017 report from Human Rights Watch. ...It's the low-paid workers who would bear the brunt of any food shortages from the blockage, which is happening in the middle of Ramadan. 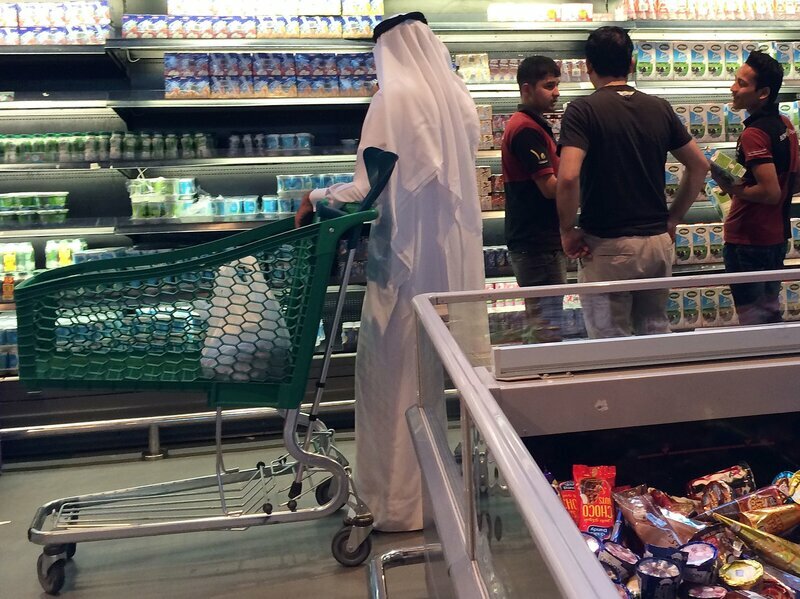 Customers shop at the Al Meera market in Doha, Qatar, on Saturday. WASHINGTON — Saudi Arabia and other Arab countries that have cut ties to Qatar issued a steep list of demands Thursday to end the crisis, insisting that their Persian Gulf neighbor shutter Al-Jazeera, cut back diplomatic ties to Iran and sever all ties with the Muslim Brotherhood. In a thirteen point list presented to the Qataris by Kuwait, which is helping mediate the crisis — the countries also demand an end to Turkey's military presence in Qatar. The Associated Press obtained a copy of the list in Arabic from one of the countries involved in the dispute. List of demands by Saudi Arabia, other Arab nations (Copied from article). 1) Scale down diplomatic ties with Iran and close the Iranian diplomatic missions in Qatar, expel members of Iran's Revolutionary Guard and cut off military and intelligence cooperation with Iran. Trade and commerce with Iran must comply with US and international sanctions in a manner that does not jeopardise the security of the Gulf Cooperation Council (GCC). 2) Immediately shut down the Turkish military base that is currently being built, and halt military cooperation with Turkey inside Qatari territories. 3) Sever all ties to all the "terrorist, sectarian and ideological organisations," specifically the Muslim Brotherhood, ISIL, al-Qaeda, Fateh Al-Sham (formerly known as Nusra Front) and Lebanon's Hezbollah. Qatar needs to formally declare those entities as terrorist groups based on the list of groups that was announced by Saudi Arabia, Bahrain, UAE and Egypt, and concur with all future updates of this list. 5) Hand over "terrorist figures," fugitives and wanted individuals from Saudi Arabia, the UAE, Egypt and Bahrain to their countries of origin. Freeze their assets, and provide any desired information about their residency, movements and finances. 6) Shut down Al Jazeera Network and its affiliate stations. 7) End interference in sovereign countries' internal affairs. Stop granting citizenship to wanted nationals from Saudi Arabia, UAE, Egypt and Bahrain. Revoke Qatari citizenship for existing nationals where such citizenship violates those countries' laws. 8) Qatar has to pay reparations and compensation for loss of life and other financial losses caused by Qatar's policies in recent years. The sum will be determined in coordination with Qatar. 9) Qatar must align itself with the other Gulf and Arab countries militarily, politically, socially and economically, as well as on economic matters, in line with an agreement reached with Saudi Arabia in 2014. 10) Submit all personal details of all the opposition members that Qatar supported and detail all support that Qatar has provided them in the past. Stop all contacts with the political opposition in Saudi Arabia, UAE, Egypt and Bahrain. Hand over all files detailing Qatar's prior contacts with and support for those opposition groups. 11) Shut down all news outlets that it funds, directly and indirectly, including Arabi21, Rassd, Al Araby Al Jadeed, Mekameleen and Middle East Eye, etc. 12) Agree to all the demands within 10 days of it being submitted to Qatar, or the list becomes invalid. 13) Consent to monthly audits for the first year after agreeing to the demands, then once per quarter during the second year. For the following 10 years, Qatar would be monitored annually for compliance. It's like the 10point demands the Austria Hungary empire made to Serbia..made with the knowledge that they were never going to fulfill it. Qatar has something Saudi Arabia wants, what is it? Yes, Austro-Hungarian ultimatum is the first that coming to mind. Accepting this will mean nothing less than giving up sovereignty. But, unlike Serbia in 1914, modern Qatar have no friends and allies among great powers. Ties with Turkey and Iran aren't enough. They may just be looking for a trigger point? If they tell Qatar to "stop supporting terrorism", Qatar refuses, they declare war on Qatar, Iran tries help Qatar, then they can finally take Iran down (with US backing). Or Qatar backs down and falls in line, further isolating Iran. OR they want all Qatar's Gas fields. They want Al Jazeera. Might as well take their sovereignty and their oil while they are at it. This is strikingly similar to demands made of the EPA by the Trump administration. EPA resisted and the Trump administration backed down. It's about f*cking time someone took those assholes out. As for the rest of the list, it's pretty much asking Qatar to give up its sovereignty (as PhoenixRu said). I doubt Qatar will comply, which means we better strap in for some action in the Middle East. ...and will MSNBC be next?